You can scroll for more information about the Felt Boot Workshop. The current session will close for registration on Jan 5th. 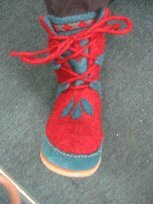 I've been wearing this pair of boots now thru, gosh it must be 9 or maybe even 11, winters now. Thru dog walking and snowshoeing and my feet have never been cold and never gotten wet. 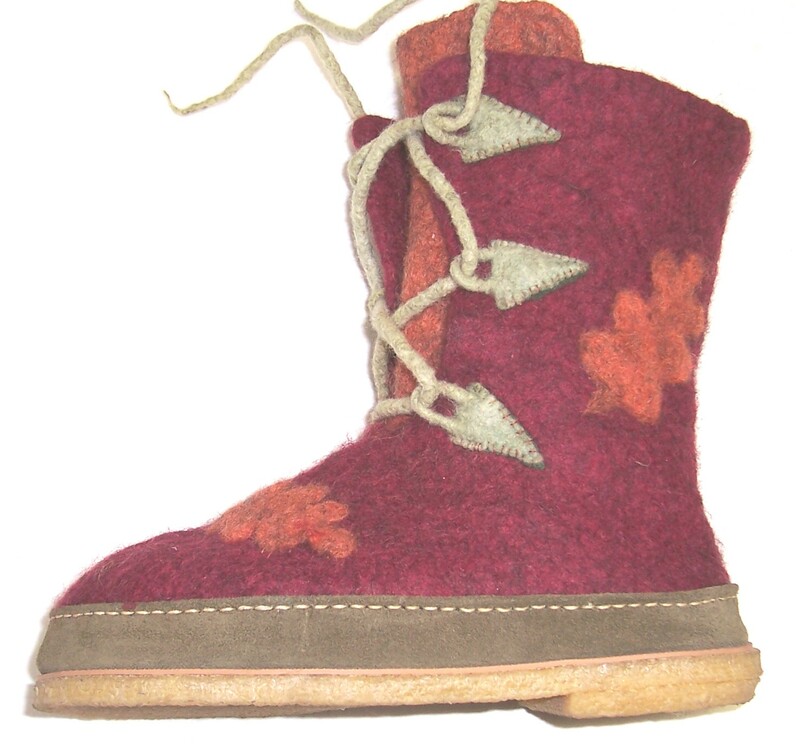 The felt boots in this workshop are made using traditional felting techniques from raw fiber....this workshop does not involve any knitting! 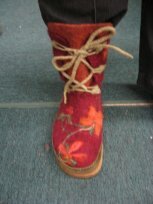 To be successful making these boots you need to have some experience in traditional, wet felting techniques already. It is best if you have made some 3-D items before....like a hat or a vessel or pair of slippers ....or at least are familiar with using a resist. This is not a beginner class, yet I've had a few people with "limited experience" take it say they learned a lot! 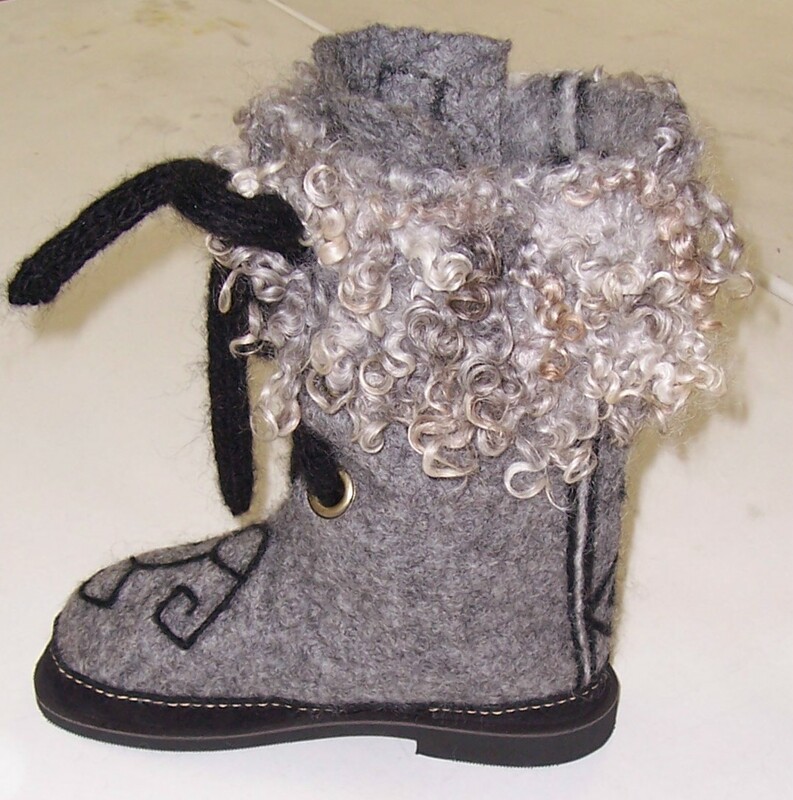 To make these boots you'll need about 1 pound of wool (max!) and you'll need to purchase soles, repurpose soles or make them yourself . Either way, this is an additional cost for you to consider in the overall cost of the boots since it is in addition to your workshop fee and whatever your fiber costs you. I include a module in the workshop on how to repurpose a sole and I also provide contact information for 2 sources of soles if you want to purchase them new. Lastly, if you want to view either a very general course outline or for previous participants boot pics & testimonias, follow the highlighted links. Within 24 hours (72 business hours if you register on a Saturday since my weekend in Sunday/Monday) of registering, you will receive an email confirming your registration. It then takes 24 hours from your confirmation email to get you set up to view the videos and access the blog. So it takes at least 2 business days from when you register before you have access to the full workshop. And longer if you register late Friday night or Saturday - Sunday since my weekend is Sunday/Monday. I will need a gmail account to set you up so you'll either need to provide that when you register thru the "notes" window in your paypal order or just email it to me separately at Northeastfiberarts@gmail.com. .